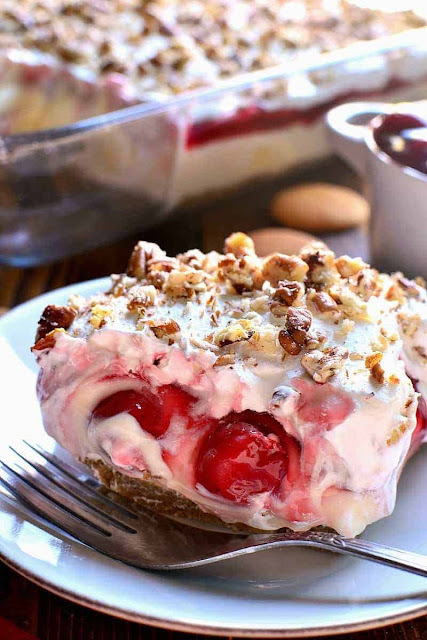 Cherry Cheesecake Lush Dessert combines the flavors of cherry cheesecake with the creaminess of lush! The perfect one pan dessert recipe for the holidays and all year round! Now, I know I’m not the only one. Who scrolls through their feed and clicks on one thing, and then another, and suddenly finds themselves on a complete stranger’s page because Facebook somehow led them there….? Tell me I’m not the only one. Who doesn’t even realize that a full hour has passed and I’ve accomplished absolutely nothing except finding out random information about random people!?!? Agghhhh! Maybe I need help. Press into a 9x13 inch baking pan; bake at 350° for 15 minutes. Remove from oven and cool. 0 Response to "Cherry Cheesecake Lush Dessert"